Exporting or importing pictures or other images is often a bit of a challenge for anyone just starting out in photo editing. However, a handful of straightforward tips in addition to straightforward explanations certainly makes this specific task much easier. First of all, it’s necessary to be aware that pretty much any image on your current personal computer, professionally produced document, t-shirt, etc., is made up of an ‘image file’. These image files can come in a variety of different platforms and each will have a unique purpose as to why they come that way. Learning which one to use is going to ensure that you will wind up having a perfect photo when all of your editing and enhancing is finished. Despite the fact that there usually are instances whereby certain images may well possess a few aspects involving each file type, that is usually not the case and is very unlikely to occur with respect to any photos or images that you are looking to edit in some way. Raster Photographs – Actually are made up of pixels that are dots set up on some sort of grid in which each and every pixel or dot happens to be a specified color. The resolution involving any Raster image actually dependent on the size of the original photo. Attempting to stretch your picture will make it look like it is out of focus and will appear ‘fuzzy’, which is referred to as being ‘pixelated’. The following will be a short explanation about all of the more well-known Raster Picture varieties. 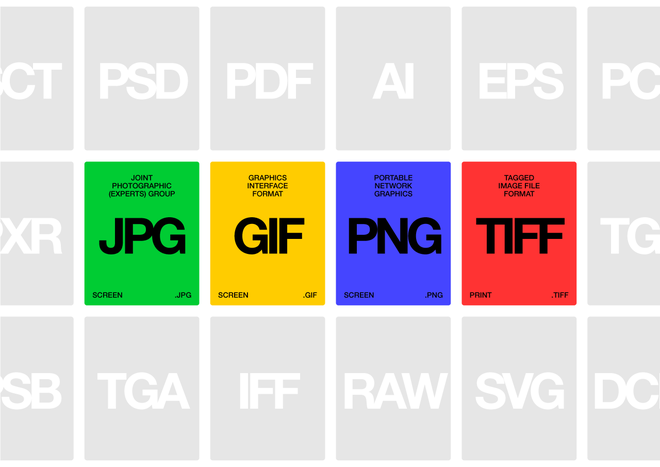 • JPEG/JPG (Joint Photographic Experts Group) – Being typically the most popular data format, your JPEG is generally utilized within email pictures, photos, along with ad banners. Working with JPEGs are really great for rapid downloading of things such as art pieces or even web based pics. They are additionally perfect with regard to publishing and picture touch-ups. JPEGs are also perfect for cutting down the dimensions with regards to the image in order for you to e mail and also sneak peek your photo. The one particular area which this file format is actually not really able to be used for is actually if you are wanting for transparency solutions in your photo. • GIF – This is without question one of the most common formats that are typically used in computer animated graphics, social media channels, electronic mails, advertising promotions, etc. A GIF is also the choice for transparencies and allows you to get your photo on a coloured background. Even though GIFs can be of a high resolution, there are a few hurdles you need to be aware of. Changing a picture to this format can sometimes decrease the original radiance of your photo and do have some restrictions when it comes to colour. • PNG – Are generally best to work with when you want to put an picture on the Web as it will give you a high-quality image. PNB photographs tend to be more radiant compared to GIFs. • TIFF/TIF – This format is commonly used in desktop publishing due to its exceptionally high quality. This kind of formatting is ideal if you intend to print your photos especially when they are large. • PDF – (Portable Document Format) – This format is typically the number one when it comes to displaying both visual as well as data files. One of the reasons for its popularity is that it is compatible with just about any app, operating system, device, as well as web-based internet browser. It’s great with respect to printing since nearly all photo printers like PDFs and they are most often when creating magazines, leaflets, posters, and so on. • EPS (Encapsulated PostScript) – An EPS file typically contains a solitary design and style element that can then end up being used in much larger models. When working with an EPS file with regard to any logo, it is good at maintaining the proper resolution regardless of the actual measurements or position of the graphic inside your project. • AI – This is the ideal format if you are creating an icon or logo as each line or shape can be made larger or smaller and maintain it original appearance. There can be instances when a person will need a number of photos that require the exact same modification. Rather than editing or dealing with them one by one, you actually can ‘batch process’ all of them at once. For instance, if you have a number of photos all of which need to be scaled down to a unique measurement; simply select the folder containing those images and Paint.NET will take you through a few straightforward steps that will make the changes to all selected photos at once. It will not only allow anyone to alter those pictures all at once, you can also download them all together. Although Paint.NET has some terrific features that are easy to use it really is designed for experienced users, the interface and extensive feature set can be a bit overwhelming for some. So, we recommend you try InPixio Photo Editor, an easy to use yet powerful photo editing software to start working on your images. It is available for Windows users with not only the basic photo editing features but also some advanced tools and amazing photo effects. Download and try it now. First click File -> open and select and image from your PC you want to edit and make the necessary changes..You can choose various file formats that include jpg, bmp, png, pdt (Paint.Net) and more. To layer images over top of each other you can navigate to “Layers” and then select “Import from file”. The image will appear as an overlay on top of the current open image. You can create several layers by importing additional photos, make the desired changes and then export the photo by clicking “File –> Save as” and saving in the desired output format. 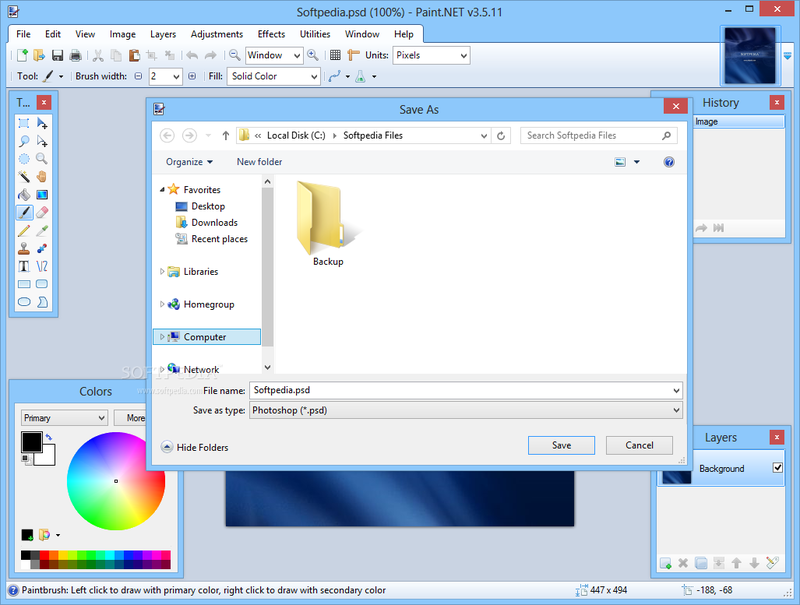 Importing/Exporting Images – Find out the difference between Raster and Vector images, different file formats and how to import/export images into paint.net. Adjusting Contrast – This section explains what contrast is all about including Brightness, Sharpness, Saturation/Hue and how they effect your images. Cropping Images – Learn how to crop photos while maintaining aspect ratios, how to switch from portrait to landscape mode, crop to specific pixel dimensions. 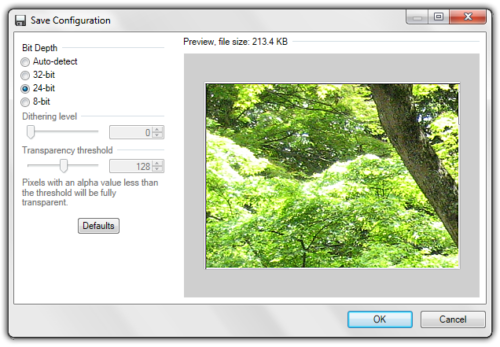 Scaling Photos – Learn about scaling images in PhotoScape and the differences between cropping, resizing and scaling your photos. Image Filters and Effects – We show you steps to applying filters and image effects in paint.net to spice up your photos!